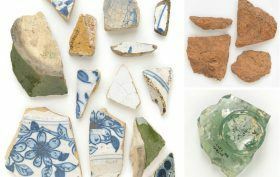 New York City has catalogued and created a digitized archive of the many buried artifacts from its past; Wednesday the Landmarks Preservation Commission is officially opening a repository of those countless artifacts. The New York Times reports that the Nan A. Rothschild Research Center–the first municipal archive devoted to a city’s archaeological collection, has found a home in Midtown Manhattan. More than a million artifacts will now be available for viewing by researchers and scholars by appointment; a digital archive is already available. The climate-controlled repository at 114 West 47th Street contains artifacts from 31 excavated sites from all five boroughs, including the city’s first major historical dig, the Stadt Huys (now 85 Broad Street in Lower Manhattan), which, when the artifacts were discovered in 1979, raised the idea that archaeological treasures were buried beneath old buildings.